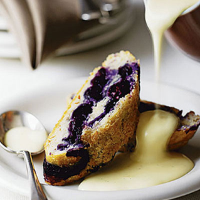 Juicy blueberries in a crisp suet pastry roll are a delicious twist on traditional jam roly-poly. Preheat the oven to 180°C, gas mark 4. Lightly grease a baking tray. Sieve the self-raising flour into a large bowl, stir in the suet and add a pinch of salt. Pour in 150ml cold water and bring the mixture together with a round-bladed knife to form a smooth dough (you may have to add a little more water if the mixture seems too dry). Roll the pastry out on a floured work surface to form a rectangle measuring about 18cm x 28cm. Mix the blueberries, plain flour and 3 tablespoons of the sugar together in a bowl. Stir in the lime juice. Spoon the mixture in a slightly off-centre strip along the length of the pastry. This will make it easier to roll. Brush the edges of the pastry with a little beaten egg. Carefully roll the pastry to enclose the blueberries, then seal the open edges. Transfer the roly-poly to the baking tray. Cut 3-4 slashes into the top of the roll and brush with beaten egg. Scatter over the remaining caster sugar and bake for about 30 minutes, until golden. Serve in slices, with custard or vanilla ice cream. Swap the lime juice for lemon juice, if you prefer. Try filling with other seasonal fruits or jam with a high fruit content. A light, sweet fizz with fresh grapey flavours will complement this pudding.